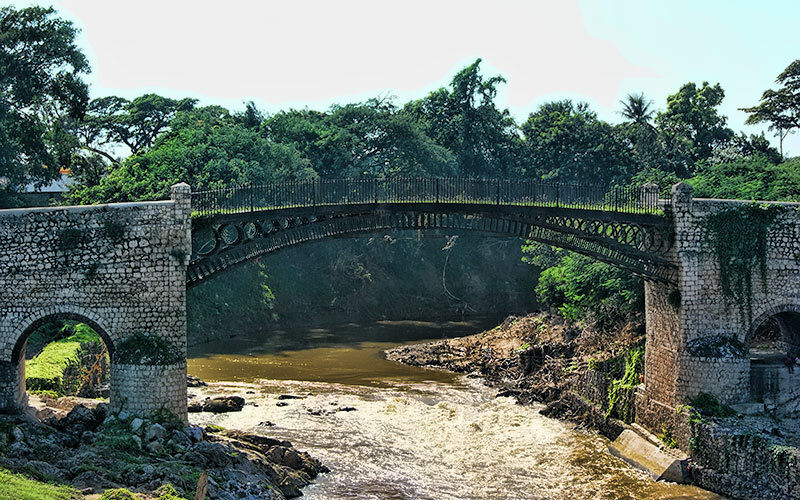 In the late 18th century, Jamaica’s House of Assembly passed an act commissioning the construction of a much-needed bridge between Kingston and Spanish Town in St. Catherine. Originally meant to be built from stone, for reasons unknown, the structure was cast from iron. Designed by Englishman Thomas Wilson, the bridge is supported by four arched ribs fitted with cast iron frames and reinforced by stone abutments on either side. The abutment of the bridge is constructed with cut stone while the bridge is cast iron. It is about 81ft long and 15ft wide. This bridge, erected in 1801, at a cost of four thousand pounds is the oldest bridge of its kind in the Western Hemisphere. The parts were manufactured in England by the Walker ironworks company,and then shipped to Jamaica for assembly . The Old Iron Bridge in Spanish Town is one of only two Walker bridges that still exist today. In 1801, construction was completed on the bridge—an 87-ton structure which spans the 82-foot (25-meter) gap created by the Rio Cobre. Due to population growth, deforestation, and other environmental factors, the characteristics of the Rio Cobre have changed dramatically since the time of construction. As a result, the foundations and abutments of the bridge have been damaged, compromising the stability of the entire structure.